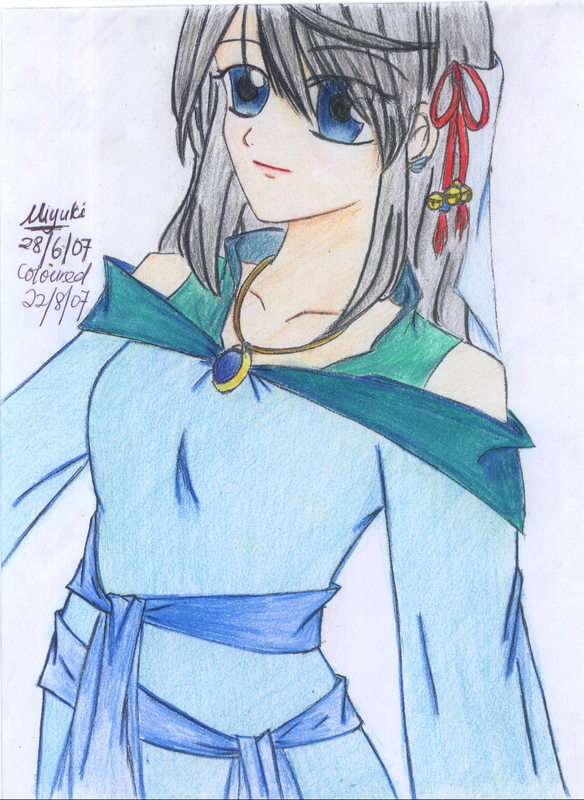 Wow,this is an extremely old work,isn't it?Anyway,thats because my dear little brother broke the scanner glass and I haven't fixed it till recently... XD What luck anyway,I photocopied the original version so that I need not pen the image in,I'm still terrible at it.Well you'll notice the colour of the dark green is kind of weird,it was not intended to be so...I spend a long time in drawing the image and colouring in.My neck was feeling so much pain,no really,pain! Good use of pastels and with what you have at your disposal. the coloring is nice.i dont feel that dark green color is wierd.Its normal so be relief.The only mistake is her left eye,slightly big i think.